Maximum performance, functionality, connectivity, and mobility in a small form factor. Tactical Kits offer many possibilities for establishing mobile Ad Hoc Networks – for radio-based communication and data acquisition, transport and backup. Different Tactical Kit options address different purposes and applications. All Tactical Kits are housed in field-proven cases to offer maximum performance, functionality and connectivity, and mobility in a small form factor. By connecting to the MIMO radio, the PTZ camera can be remotely controlled and the camera’s image is available at any point in the mesh. Each MIMO radio acts as an active node in the mesh network, and works as transmitter and receiver. In this way, each radio also works as a repeater if necessary. By using the prism camera, the sight of the sniper or an observer with a telescope is transmitted in real time to the command control centre. For advanced flexibility during operations, we offer a Mobile Command Kit to set up a command centre close to the operation or at any other location. The Mobile Command Kit can be used as a client to monitor the other radio nodes. Alternatively, it can operate as a server in the Ad Hoc Network, control all radio nodes in this network, and provide data backup. Body Worn Kits transmit the signals of the body-worn camera "on the man" to the command centre or to other team members. They are a decisive assurance of success in tactical operations. Just as important is the transfer of location data of team members, its integration into situation awareness software as well as integration of voice communication. Our Body Worn Kits meet all these requirements. With the Universal Support Kits, users have still greater flexibility when using Tactical Kits remotely. They ensure the power supply and network connection for the MIMO radios and the accessories included in the kits. 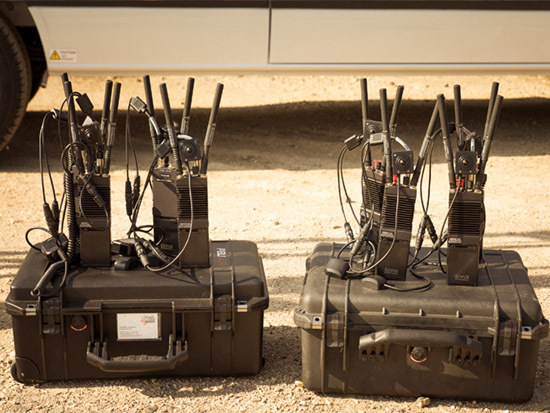 While Broadcast Solutions offers Tactical Kits as preconfigured solutions, other individual configurations of the kits are also possible, depending on the customer's wishes and the intended use. Tactical Kits can be operated as stand-alone solutions or used with permanently installed units. Use with mobile command centres offers still greater flexibility. In these vehicles, the kits can be placed and loaded in the storage space. The possibilities regarding different vehicles are almost endless – Broadcast Solutions can integrate the technology required for a mobile operations centre into a wide variety of vehicles. Various solutions for network monitoring, data viewing and security, communication, situation monitoring with PTZ cameras on special masts in the vehicle and through the data of an Ad Hoc Network or lounges for team members are all possible.